unsatisfactory for leaching. Some other disposal method should be used. The test for leaching should be made by digging a pit about one half of the proposed depth of the cesspool, with a test hole 1 foot square and 18 inches deep at the bottom. The test hole is filled with 6 inches of water and allowed to drain off. Six inches of water is again added, and the downward rate of percolation is measured in minutes required for the water surface to lower 1 inch in the hole. Leaching fields are an integral component of a septic tank individual sewage disposal system. Leaching field may be referred to as tile fields or absorption trenches. Whichever term is used, the function, testing, construction, and maintenance techniques of this component remain the same. The lines in a leaching fields are built of 4-inch PVC perforated pipe. Many types of perforated pipe are commercially available for use in leaching-field construction. Before installing a leaching field in a specified area you must perform a percolation test. This test determines whether the area selected is suitable for subsurface sewage disposal; it also helps you to determine the overall size of the leaching field in relation to trench dimensions and pipe lengths. The test consists of digging a test pit 2 feet square and at least 1 foot in depth. The optimum depth should be at the deepest point that the leaching pipe will be laid. Next dig a hole 1 foot square by 1 foot deep in the test pit. Fill this hole with 7 inches of water for wetting purposes. Allow the water to drop to 6 inches before recording the drop time. 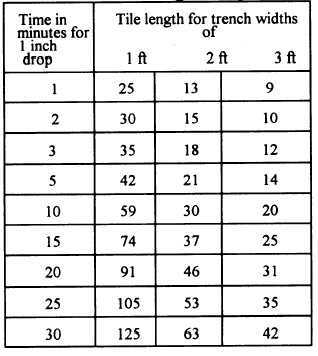 Then note the time required for the level to drop 1 inch (from 6 to 5 inches) in depth. 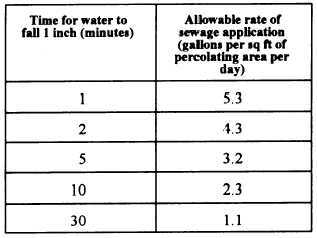 You can then determine the length of pipe in the leaching field by using table 10-16. Note that this table is based on the assumption that 4-inch pipe will be used as recommended by the National Standard Plumbing Code.